These days, I'll find any excuse to try a new recipe. So when I was happily faced with the task of baking something chocolatey for a coworker's birthday, oreo brownies popped into my head. After some poking around, I found and adapted a recipe from Michelle at Brown Eyed Baker, a lovely food blog that I highly recommend. Turns out that oreos, cream cheese, and brownies are 3 of my coworker's favorite things. Needless to say, these were a hit! There's pretty much no reason I can think of to not adore these brownies. They're really easy, too. I used my KitchenAid mixer but they can be easily mixed by hand if you don't have one. P.S. I feel the need to tell the world that my husband and I met 5 years ago today. Yay! 1. Heat oven to 350°F. Grease an 8-inch square baking pan well. 2. Stir together butter, 1 cup sugar and vanilla in a bowl. Add eggs, beat well. In a separate bowl, stir together flour, cocoa, baking powder and salt; gradually add to egg mixture, beating until well blended. Spread batter evenly in prepared pan. 3. Stir together the cream cheese and 1/3 cup sugar with a spoon until smooth and well blended. Gently stir in in the chopped Oreos. 4. 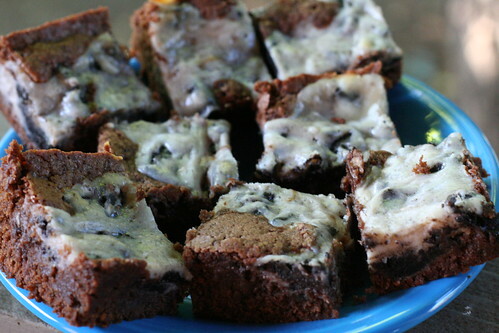 Using a spoon, spoon the cream cheese/Oreo mixture in nine evenly-spaced dollops on top of the brownie batter. Using a dull knife or icing spatula, gently swirl the cream cheese mixture with the brownie batter. After swirling, gently push the cream cheese mixture down into the brownie batter. 5. Bake 30 to 35 minutes or until brownies begin to pull away from sides of pan and the batter in the center of the pan feels just set. Cool completely in pan on a wire rack. Oh my gosh, such a tease! Because I don't have the stuff on hand to make these. And it's too freaking hot to make a store run! wow, these look delicious!!!! I love oreos and I love brownies! Why have I never made these?!! ?